Cowboy Calico Beans. 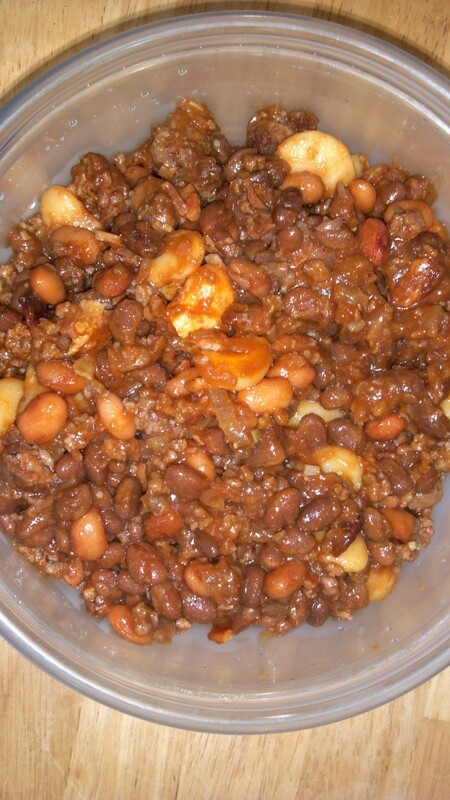 This is a casserole type of dish consisting of ground beef, thick cut bacon, 3 kinds of beans, onion, and spices. If you haven't done so already, rinse your pinto and northern beans using a colander. You can use dried beans for this. Just make sure you soak them overnight before using. Preheat oven to 350F degrees. Begin browning your ground beef in a medium pan over medium heat. Add in diced onion and garlic. Cook beef until brown and crumbled and onion is translucent. Drain excess fat from cooked ground beef. 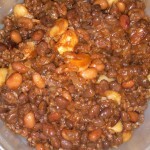 In a large bowl, combine ground beef mixture, cans of baked beans, rinsed pinto and northern beans, crumbled bacon, ketchup, brown sugar, vinegar, salt and dry mustard. Stir well. Spray a 9x13 baking dish with nonstick cooking spray. Pour in your bean mixture. Cover with aluminum foil and bake for about 45 minutes. Then remove foil and bake for additional 5-10 minutes. Cowboy Calico Beans. This is a modified version of a recipe that we found on Facebook. I have to admit, I was skeptical on this one. It turned out to be really good. And, looking back, I’m not sure why I doubted it: beef, bacon, beans, and spices are all good ingredients. Logically it should lead to a pretty good dish. Mitch built this one and I made some cherry almond muffins to go with it. We were both pretty happy with how it turned out. One star?? Are you nuts? Not only did we both enjoy it a surprising amount, but your dad went back for seconds! Give it FOUR stars, at least!